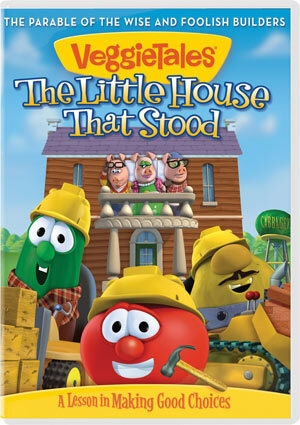 VeggieTales Celebrates Easter with The Little House That Stood DVD Adventure! VeggieTales® Celebrates Easter With A Brand-New Building Adventure! FRANKLIN, TN (January 30, 2013) — Big Idea Entertainment, a leading studio and producer of children’s and family programming, characters and brands, announced today they will release an all-new DVD title, VeggieTales®: The Little House That Stood on March 2 and March 5, 2013 in Christian and general markets stores respectively, just in time for the Easter season. VeggieTales®: The Little House That Stood features a cast of many fan-favorite VeggieTales® characters including Bob, Larry, Junior Asparagus, The French Peas, Madame Blueberry and others. 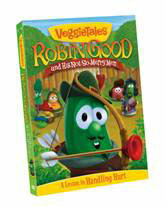 For the first time ever, this DVD parodies beloved nursery rhymes, with a signature VeggieTales® twist. Families will enjoy learning the Biblical story of the wise and foolish builders made understandable for kids based on Matthew 7:24-27, making it a delightful addition to a child’s Easter basket. Additionally, the story of “Humpty Dumpty” is hilariously re-told around the good neighbor parable in “The Good Egg of Gooseville,” inspired by Luke 10:27-37, the Parable of the Good Samaritan. The DVD also features a brand-new Silly Song, “Happy Tooth Day,” and “The History of Mother Goose” bonus features among others. A comprehensive marketing, advertising and licensing campaign supports The VeggieTales®: The Little House That Stood. Promotional partners include Chuck E. Cheese’s® with in-store video monitor clips, Big Boy® Restaurants with special kid’s menus and placements. Non-profit partner Focus on the Family® is also working with Big Idea on initiatives that help teach families and children the importance of building their lives on a solid foundation. When the Three Little Pigs roll into Cabbageville looking to build some new houses, they meet one builder with a plan and two without a clue! Larry builds with hay, Mr. Lunt with bricks, but only Bob builds his houses on a firm foundation – following the wise plans from the “Master Builder’s Handbook!” Will the Little Piggies make the right choices when it comes to building their houses – and their lives – on solid ground? Find out in this parable that shows kids when they follow God’s blueprints, they can stand strong when the storms come! PLUS! Ever wonder what happened before Humpty cracked? Find out in this very Veggie retelling of the classic Humpty Dumpty story, “The Good Egg of Gooseville,” where we learn that a good neighbor always “lends a little hand” to those in need! The title’s marketing and advertising campaign includes extensive print, radio, and online advertising, as well as social media promotions on Facebook, Twitter, Tumblr, Pinterest, YouTube and interactions with mom and parenting bloggers. Street level promotions with close to 300 members of the VeggieTales Ambassador team are also slated to take place this spring. Chuck E. Cheese’s® will run indoor advertising on closed-circuit televisions at over 500 locations. Clips from the Little House That Stood DVD and the Silly Song “Happy Tooth Day” will play in their birthday party areas. Exclusive VeggieTales®: The Little House That Stood Kid’s placements will be available at Big Boy® Restaurantsspring 2013. Safeway™ stores will offer customers a free package of Capri Sun® SuperV when they purchase The Little House that Stood DVD. Christian retail stores will offer a $10 mail in rebate when customers purchase both The VeggieTales Bible (NIRV) from Zondervan® and The Little House That Stood DVD. In addition to the DVD and the Bible, the floor display will also include Veggie Easter Egg Coloring Kits and A Very Veggie Easter Collection, featuring two Veggie Easter movies on DVD and two compilations of Easter and worship songs on CD. Big Idea Entertainment has teamed up with Focus on the Family® for a Discussion Guide that is part of the Little House DVD. Focus on the Family® will promote the release through their various channels including online initiatives and in Clubhouse Jr.® Magazine. Long-term partner World Vision® will also promote the DVD in the World Vision Spring Gift Catalog. Big Idea Entertainment is celebrating 20 years as a leading studio and producer of children’s and family programming, characters and brands. Big Idea’s best-selling series VeggieTales® is a one of the most recognized brands in the US with moms of pre-schoolers*. Since 1993, VeggieTales® has sold 60+ million videos, 13 million books and more than 7 million CDs. VeggieTales® and Big Idea’s property, 3-2-1 Penguins!®, enjoyed four seasons as top-rated series on NBC Saturday mornings, Telemundo and ION TV. The studio’s two theatrical releases, Lionsgate’s Jonah-A VeggieTales Movie® (2002), and Universal Pictures’ The Pirates Who Don’t Do Anything®-A VeggieTales Movie® (2008), are distinguished among the most successful faith-based films of all time. Big Idea also maintains an extensive presence in publishing, licensing and live entertainment arenas. For more information on Big Idea, visit: www.VeggieTales.com. 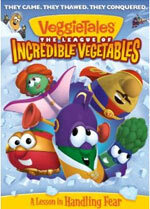 VeggieTales "League of Incredible Vegetables" Out Oct. 13! Available in Christian stores Saturday, October 13 and everywhere Tuesday, October 16, VeggieTales: The League of Incredible Vegetables is the fourth title in a series of DVD releases that stars the popular “LarryBoy” character while introducing four new superheroes played by beloved VeggieTales characters Bob the Tomato, Petunia Rhubarb, Junior Asparagus and Mr. Lunt, all with hilarious superhero abilities! Based on Psalm 56:3 (ESV) which says, “When I am afraid, I will put my trust in You,” this all-new episode helps teach a lifelong lesson in handling fear, one of the most requested subject topics by VeggieTales fans and families, and features a brand-new League theme song and music video by GRAMMY-nominated and Dove Award-winning group, Newsboys! GRAMMY-NOMINATED AND DOVE-AWARD-WINNING GROUP, NEWSBOYS! Next week, VeggieTales Co-creator and voice of “LarryBoy,” Mike Nawrocki, and Newsboys Front man Michael Tait and Drummer Duncan Phillips, will team up for a national radio tour in support of The League of Incredible Vegetables. Nawrocki, Tait and Phillips will discuss the brand-new new DVD title and the Newsboys’ involvement as the first humans in history to appear in an animated VeggieTales video. Fans will have the opportunity to hear about the new episode and the music video with the Newsboys on numerous national radio networks and top market stations including The Rick & Bubba Show, American Family Radio, Salem Broadcasting’s The FISH, Family Life Network, IRN/USA Radio Network, The Moody Broadcasting Network and many more. There will also be a special radio feature to air later on the nationally broadcast radio show, Keep the Faith. Big Idea Entertainment had a special opportunity to work with Kristina Barrett, a little girl stricken with a life-threatening illness, whose wish to be the voice of a VeggieTales character, was granted in conjunction with release of The League of Incredible Vegetables. Kristina visited Big Idea’s headquarters last year in Franklin, TN with her family to meet VeggieTales Co-creator Mike Nawrocki and staff and to voice a character (girl pea) for the all-new multi-superhero DVD! Kristina will attend the VeggieTales movie premiere to celebrate the release of this brand-new episode at Kingwood Bible Church in Kingwood, TX (Houston) on Saturday, October 13 and to be part of the Kristina Barrett Benefit to raise funds to help with her existing medical expenses from 12:00 pm – 3:00 pm CDT! Watch “The League of Incredible Vegetables” Music Video Featuring the Newsboys! This fall, as part of the VeggieTales Live! God Made You Special Tour, audiences nationwide will have the opportunity to watch the League movie trailer and the Newsboys music video in support of the new DVD. Information on the tour, including the latest itinerary, may be found at http://veggietales.com/live/. FRANKLIN, TN (September 5, 2012) — Light the fire, make the cocoa and get ready for a VeggieTales Christmas marathon! Big Idea Entertainment, a leading studio and producer of children’s and family programming, characters and brands, announced today they will release all of their VeggieTales® Christmas titles as part of a DVD box set, VeggieTales: The Ultimate Christmas Collection, on September 29 and October 2, 2012 in Christian and general market stores respectively. For the first time ever, the VeggieTales holiday classics will be packaged together in VeggieTales: The Ultimate Christmas Collection, providing close to four hours of entertainment for families! DVD titles included in this special collection are The Toy That Saved Christmas, The Star of Christmas, Saint Nicholas: A Story of Joyful Giving, It’s a Meaningful Life, The Little Drummer Boy and VeggieTales: Sing-along Christmas Songs. As a bonus, VeggieTales: 25 Favorite Christmas Songs! CD will also be part of the three-disc box set. VeggieTales: The Ultimate Christmas Collection will be supported by national print, online and radio advertising, as well as through social media promotions on Facebook, Twitter, Tumblr, Pinterest and YouTube. This set contains VeggieTales’ entire Christmas collection. Now your family can enjoy classic holiday shows The Toy That Saved Christmas—a lesson in giving; The Star of Christmas—a lesson in how to love; Saint Nicholas—a story in joyful giving; It’s a Meaningful Life—a lesson in being content; and The Little Drummer Boy—a story about hope, love and forgiveness. Also included in the collection is the VeggieTales: Christmas Sing-along Songs DVD and 25 Favorite Christmas Songs! CD. Digital VeggieTales Storybooks Coming Soon To Your Phone! FRANKLIN, TN (May 10, 2012) — Big Idea Entertainment, a leading studio and producer of children’s and family programming, and Ruckus Media Group, the global children’s digital media company, announce a digital partnership under which Ruckus has been granted worldwide rights to develop interactive storybook applications – iReaders — based on VeggieTales, the most successful faith-based brand in the world. With witty humor and lively animation, VeggieTales teaches timeless values and meaningful lessons to children through hilarious storytelling, silly songs and lovable characters with brand sales of more than 60 million videos, 13 million books, 7 million CDs, and licensees with over 400 very Veggie fantastic products. Designed for children ages 4-8, these new Ruckus mobile applications for iOS devices give families the opportunity to interact with their favorite characters at home or on the go and, at the same time, empower parents with a digital report card providing direct, actionable feedback on their child’s reading, the cornerstone of the Ruckus Reader program. The VeggieTales Ruckus iReaders will present wholesome values and lessons like honesty, forgiveness, patience and thankfulness, lessons that are easy for children to understand and that help guide them in their day-to-day lives. Designed for children ages 4-8, Ruckus will launch three iReaders in varying reading levels, worldwide with English language distribution via the App store in June 2012. The iReaders will be based on Big Idea’s bestselling DVD’s “Pistachio” (level 1), “Sweetpea Beauty” (level 2), and “Big River Rescue” (level 2). A fourth title is already in production to tie-in to Big Idea’s major Fall 2012 release “The League of Incredible Vegetables” (level 3). Powered by the Ruckus Reader, iReaders are designed to match age-appropriate standards determined by the Common Core State Standards and reinforce national educational standards for preschool through second grade. As children enjoy VeggieTales® original stories and content, parents receive weekly Reader Meter reports that assess their child’s in-app reading skills, such as phonics and word recognition, print and phonological awareness, fluency, alphabetic knowledge, sequencing and story comprehension in real time. Story-driven activities such as word builders, letter and word hunts, hidden pictures, mazes, find-the-difference games and make-your-own-sticker or diary pages help teach phonics, letter and word recognition, rhyming, syllables, reading comprehension and more. Ruckus Media Group creates interactive applications for mobile devices designed to entertain and educate children ages 3-8. Launched in September 2010, the company’s centerpiece is the Ruckus Reader (released April 2012), a breakthrough learning program for the iPad featuring digital storybooks that delight children with interactive content from the most popular names in entertainment (Hasbro, Crayola, SeaWorld, The Wiggles, Cyberchase, Dino Dan and Veggie Tales). It also provides parents with an innovative reading assessment tool and personalized feedback on their child’s reading experience. Within days of its launch, four of the initial Ruckus Reader bookshelves hit the iTunes Top 10 Chart (Books category, free iPad apps). Previously released award-winning digital storybooks include the #1 iTunes best-selling and Mom’s Choice Gold Award winner “My Little Pony: Twilight Sparkle, Teacher for a Day,” based on the ever-popular Hasbro toy characters; Parents’ Choice and Mom’s Choice Award winners “Spot the Dot,” by pop-up legend David A. Carter, and “Chuck & Friends: Friends for the Long Haul”; About.com Readers’ Choice Award winner and Best App Award finalist “A Present for Milo,” written and illustrated by Mike Austin; “The Velveteen Rabbit: Told by Meryl Streep” and other read-play-and-record-along classic animated storybook apps. For a full listing of titles and additional information, see the Ruckus Reader website www.RuckusReader.com and the Ruckus Media Group iTunes page and follow Ruckus on Facebook and Twitter. Big Idea Entertainment is a leading studio and producer of children’s and family programming, characters and brands. Big Idea’s best-selling series VeggieTales® is a leading animated home video series in the US with moms of pre-schoolers*. Since 1993, VeggieTales® has sold 60+ million videos, 13 million books and more than 7 million CDs. VeggieTales® and Big Idea’s property, 3-2-1 Penguins!®, enjoyed four seasons as top-rated series on NBC Saturday mornings, Telemundo and ION TV via the qubo® children’s programming block. The studio’s two theatrical releases, Jonah-A VeggieTales Movie® (2002), and Universal Pictures’ and Big Idea’s The Pirates Who Don’t Do Anything®-A VeggieTales Movie® (2008), are distinguished among the most successful faith-based films of all time. Big Idea also maintains an extensive presence in publishing, licensing and live entertainment arenas. For more information on Big Idea, visit: www.VeggieTales.com. FRANKLIN, TN (May 1, 2012) — Big Idea Entertainment, a leading studio and producer of children’s and family programming, characters and brands, announced today they will release a brand-new DVD title, VeggieTales®: The Penniless Princess-God’s Little Girl, on August 11 and August 14, 2012 in Christian and general market stores respectively. This title follows the release of the top-selling VeggieTales®: Sweetpea Beauty-A Girl After God’s Own Heart and VeggieTales®: Princess & the Pop Star, both of which featured lessons of specific interest to young girls. The DVD’s story is based on the children’s book, A Little Princess, by Frances Hodgson Burnett, and helps to teach an important lesson about knowing your own true worth inspired by Philippians 4:8, as well as trusting God, no matter what happens in life, based on Romans 8:39. VeggieTales: The Penniless Princess-God’s Little Girl includes plenty of engaging and fun music fit for families, with the all-new Silly Song “Best Friends Forever” and the featured song “No Matter What,” both in sing-along versions in the DVD bonus features. Other bonus features include a special tour of London with the popular French Peas characters, a hilarious look at the history of the Teddy Bear, a discussion guide for parents and behind the scenes clips. VeggieTales: The Penniless Princess-God’s Little Girl‘s launch is supported by a comprehensive marketing, advertising and licensing campaign. Promotional partners include Chuck E. Cheese’s® with in-store video monitor clips and VeggieTales activity booklets. Starting this summer, Big Idea Entertainment will hold MLB and MiLB stadium DVD promotions during select games. “Princess Party” live events will take place in select retailers and churches to coincide with the DVD release date. Sweet Sarah Crew has everything a little girl could want – a loving family, lots of friends and a closet full of frilly dresses! But when life takes a turn and Sarah goes from riches to rags, will she realize that her true worth lies not in what she has, but what she has in her heart? Find out in this inspiring new story from VeggieTales that reminds kids who they are in God’s eyes. The title’s marketing and advertising campaign includes extensive print, television, radio, and online advertising, as well as social media promotions on Facebook, Twitter, Tumblr, Pinterest, Google+, YouTube and interactions with mom and parenting bloggers. A theater trailer promotion will air on more than 1,000 screens across the country, and street level promotions with more than 250 members of the VeggieTales Ambassador team are also slated to take place this summer. Chuck E. Cheese’s will run indoor advertising on closed-circuit televisions and in their birthday party area at over 500 locations. Clips from The Penniless Princess DVD and the Silly Song “Best Friends Forever” will play, and nearly half a million VeggieTales activity booklets will also be available in the prize redemption area. The activity booklets will feature Penniless Princess themed puzzles and games, and will mention the DVD release date. Big Idea Entertainment has teamed up with Mercy Ministries® to help hurting girls free of charge restart life with a new perspective. VeggieTales: The Penniless Princess-God’s Little Girl will feature a custom promotional video to help drive donations to the ministry’s Mercy360 program and encourage supporters to play a vital role in restoring lives for less than $1/day. There will also be a Mercy Ministries ad on the DVD’s insert. In addition, the partnership will encompass an email campaign, website presence, radio promotions, social media presence and mentions in some of Mercy Ministries’ Founder Nancy Alcorn’s speaking engagements. Other non-profit organization partnerships include a continuing campaign with American Heritage Girls with a co-branded guide for girls to help understand their true worth, and a VeggieTales “The Penniless Princess” badge program. In addition, VeggieTales will partner again with MOPS (Mothers of Preschoolers) during the August national convention with VeggieTales animation to introduce key speakers, plus co-branded lesson guides as a resource to young mothers. Starting in August, Big Idea Entertainment will roll out a line of VeggieTales Princess-themed toys and books including a God’s Little Girl Journal and Devotional Prayer Book, God’s Little Boy Journal and Devotional Prayer Book, a Bath Toy, Princess Dress-Up Set, a Ring Stacker and a Learning Carpet and Pop-Up Playhouse. DVD promotions including on-field contests and games, DVD giveaways for a row of seats, and jumbo-screen graphics and animations with VeggieTales characters in-action will take place in select stadiums at over 70 MLB and MiLB games this summer. Christian retail outlets will coordinate “Princess Parties,” DVD screening and events at over 250 stores nationwide, and more than 1,500 churches will host events to show The Penniless Princess and organize “Princess for a Day” events starting in July. FRANKLIN, TN (April 4, 2012) — Big Idea Entertainment, a leading studio and producer of children’s and family programming, announced today that it has expanded its digital program for its popular VeggieTalesÒ brand by partnering with mobile kid-play experts, Playful Owl, an app developer focused on meaningful play, and social media development and marketing company, GorillaSpot, which creates video applications across web, social and mobile platforms for producers of premium entertainment content. These partnerships come on the heels of a successful launch with Weeblets, a developer and publisher of mobile apps for kids, for The VeggieTales Spotisode Collection™ that’s currently available on Android and iPhone. Within the first few days of its exclusive launch in the Amazon Appstore in February, the app became the number one free app for kids, and reached as high as number 11 overall. VeggieTales is the first property to launch with Playful Owl’s Step-by-Story reading readiness mobile app. With Step-by-Story, children two through six years old can create their own short story through a series of simple and entertaining choices. The app automatically turns their choices into an animation that can be shared with parents and friends. Big Idea has recently launched VeggieTales: The Goofy Gift and VeggieTales: Larry’s Missing Music, with six other additional titles scheduled to roll out this year. Each title includes over 500 possible story combinations, and promotes reading readiness by associating words, pictures and sounds. Apps are available for Android, iPhone and iPad. Big Idea is working with ReelCards powered by GorillaSpot to introduce VeggieTales ecards. Fans will be able to access the ecards through a Facebook application that will enable them to send personalized video cards using short clips from popular VeggieTales titles. They will be available for various occasions including birthdays, holidays and other special moments, and can be used as part of daily communications with friends and family. This launch is expected to roll out this summer and will be available as a mobile app on Android and iPhone beginning early summer 2012. Within the first month of its launch, The VeggieTales Spotisode Collection surpassed one million games played. The app consists of fan-favorite clips from the VeggieTales series and presents children with the challenge to find or “spot” objects in the videos. Each clip helps develop motor skills as they play through the various themed levels. A child’s success with a “spot list” opens up new levels built on additional videos that teach new important lessons with updates scheduled regularly and for special occasions. Upcoming updates will include VeggieTales: Robin Good and His Not- So- Merry Men, featuring new game levels based on scenes from the new video release. These app releases are just the first of many that Big Idea Entertainment has in development and slated to roll out later this year. Big Idea Entertainment is a leading studio and producer of children’s and family programming, characters and brands. Big Idea’s best-selling series VeggieTales® is a leading animated home video series in the US with moms of pre-schoolers*. Since 1993, VeggieTales® has sold 56+ million videos, 13 million books and more than 7 million CDs. VeggieTales® and Big Idea’s property, 3-2-1 Penguins!®, enjoyed four seasons as top-rated series on NBC Saturday mornings, Telemundo and ION TV via the qubo® children’s programming block. The studio’s two theatrical releases, Jonah-A VeggieTales Movie® (2002), and Universal Pictures’ and Big Idea’s The Pirates Who Don’t Do Anything®-A VeggieTales Movie® (2008), are distinguished among the most successful faith-based films of all time. Big Idea also maintains an extensive presence in publishing, licensing and live entertainment arenas. For more information on Big Idea, visit: www.VeggieTales.com. THERE’S NO HURT TOO BIG FOR GOD! FRANKLIN, TN (January 5, 2012) — Big Idea Entertainment, a leading studio and producer of children’s and family programming, characters and brands, announced today they will release a brand-new DVD title, VeggieTales®: Robin Good and His Not-So-Merry Men, on March 3 and March 6, 2012 in Christian and general market stores respectively, just in time for the Easter holiday. VeggieTales: Robin Good and His Not-So-Merry Men will feature plenty of high-energy, family-friendly music, including a new Silly Song with a theme that was selected through a recent online fan contest. The episode, based on Psalm 55:22 which says, “Give your burdens to the Lord for He will take care of you,” also includes the animated short, “Lenny & the Lost Birthday,” which further helps teach lessons about handling hurt and forgiveness. The DVD launch is supported by a comprehensive marketing and advertising campaign. Licensing and promotional partners include Chuck E. Cheese’s® with in-store video monitor clips and FATZ Restaurants® with kids meal activity books, stickers, cups and retail coupons. Beginning in March, Big Idea Entertainment will hold promotional events at multiple NHL and NBA games. In addition, live events will be held nationwide at select theaters, retailers and churches, plus promoted during the VeggieTales Live! God Made You Special! tour, which launches February 26 in 35 markets, to coincide with the DVD release. A long time ago, in the faraway town of Bethlingham, roved a band of merry men, led by the fearless Robin Good. Their mission: to help people by fundraising from the rich and giving to the poor! But when a greedy Prince starts stealing the townspeople’s hams, donations are down and Robin’s friends take off and decide to give robbing from the rich a try. Feeling rejected, Robin thinks things can’t get any worse, until he finds out that the ham-hoarding Prince has also captured his friends. Can Robin overcome his own hurt, rescue his friends and restore the townspeople’s hope? Find out in this fun Veggie story where kids learn that there’s no hurt too big for God! Will someone, anyone, remember Lenny’s special day? How could it be misplaced – or is it just his mistake? The VeggieTales: Robin Good and His Not-So-Merry Men marketing and advertising campaign will focus on national print, television, radio, online and social media promotions. Big Idea Entertainment will schedule television promo spots featuring “Win a DVD” and grand prize packages to air in select top markets, along with “Win It Before You Buy It” on-air radio DVD promotions in more than 100 top VeggieTales markets. The title’s social media campaign will include presence on Facebook, Twitter, Tumblr, Pinterest, YouTube, mommy bloggers and more. Street level promotions will also take place timed to coincide with the DVD release date, with over 250 members of the VeggieTales Ambassador team. Select FATZ Restaurants will offer VeggieTales: Robin Good and His Not-So-Merry Men kids activity book menus and cups this February through April, 2012, and more than 500 Chuck E. Cheese’s locations nationwide will show clips from the DVD, including the new fan-submission themed Silly Song, on closed-circuit televisions and in the birthday party areas on the jumbo-screen. VeggieTales Robin Good activity booklets with retail coupons and sticker sheets will also be available at select Chuck E. Cheese’s prize redemption areas. Big Idea Entertainment has teamed up with long-term partner World Vision®, to continue building a greater awareness of how families can help care for those in need with opportunities to sign up for child sponsorships through World Vision at http://www.worldvision.org, as well as in person at numerous Christian retail stores across the country. A promotional clip on the DVD will encourage families to learn more about World Vision’s child sponsorships along with information in World Vision’s Spring Gift Catalog. Beginning this February, Big Idea Entertainment will roll out a line of VeggieTales: Robin Good and His Not-So-Merry Men themed consumer products. Merchandise will include Sticky Mosaic craft sheets from The Orb Factory® plus lenticular puzzles and VeggieTales themed comfort bandages with the message “There’s No Hurt Too Big For God!,” both by Big Idea Entertainment, among other items. DVD promotions on select NHL and NBA jumbo-screens will air this spring season at a total of over 60 professional games. Big Idea Entertainment will coordinate audience DVD giveaways and on-ice and on-court contests and games between periods and quarters. Over 250 Christian radio station and retail outlets will coordinate “Spring/Easter Spectacular” theater screenings and in-store events to coincide with the March 3 DVD release date. More than 1,500 churches nationwide also plan to host events to show Robin Good starting in February. VeggieTales Live Stage Show Returns This Spring! VEGGIETALES® ARE LIVE AND COMING TO A STAGE NEAR YOU! FRANKLIN, TN (December 14, 2011) — Big Idea Entertainment, a leading studio and producer of children’s and family programming, characters and brands, announced today they will debut their all-new VeggieTales Live! God Made You Special tour in over 30 major markets nationwide-including Atlanta, Nashville, Jacksonville, Birmingham and more-beginning February 23, 2012. For the current tour itinerary, ticket information and group sales, please visit veggietales.com/live or iTickets.com. Popular VeggieTales® characters Bob, Larry and the rest of the cast bring zany antics to the stage with amusing, engaging storytelling and lots of music! The show includes crowd-pleasing Silly Songs like “His Cheeseburger,” “Love My Lips,” “The Hairbrush Song” and many more. Plus, families will enjoy the timeless values and lessons that celebrate just how unique and special each person is in a high-energy musical extravaganza. World Vision® has partnered with Big Idea Entertainment as a sponsor for the VeggieTales Live! God Made You Special tour. Through World Vision’s child sponsorship efforts, countless lives have changed for children and their whole communities by providing access to necessities like clean water, health care, education and much more. Big Idea Entertainment is a leading studio and producer of children’s and family programming, characters and brands. Big Idea’s best-selling series VeggieTales® is the #1 animated home video series in the US with moms of preschoolers*. Since 1993, VeggieTales® has sold 56+ million videos, 13 million books and more than 7 million CDs. VeggieTales® and Big Idea’s property, 3-2-1 Penguins!®, enjoyed four seasons as top-rated series on NBC Saturday mornings, Telemundo and ION TV via the qubo® children’s programming block. The studio’s two theatrical releases, Jonah-A VeggieTales Movie® (2002), and Universal Pictures’ and Big Idea’s The Pirates Who Don’t Do Anything®-A VeggieTales Movie® (2008), are distinguished among the most successful faith-based films of all time. Big Idea also maintains an extensive presence in publishing, licensing and live entertainment arenas. For more information on Big Idea, visit: www.VeggieTales.com.